The Mont Blanc Tunnel provides a crucial road link between France and Italy. It is 11.6 km long and is used by around 12,000 lorries each week, plus a double number of cars, although the volume of car traffic is subject to seasonal fluctuations. The tunnel was completed in 1965 and was in continuous use until 1999 when a disastrous fire meant that it had to be closed for three years. As part of the refurbishment following the fire, new control systems were installed for all the major functions in the tunnel including, for example, ventilation fans, toll barriers and lighting. 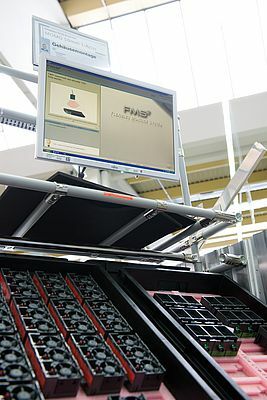 Altogether, the tunnel’s control systems used 41 programmable controllers (PLCs). 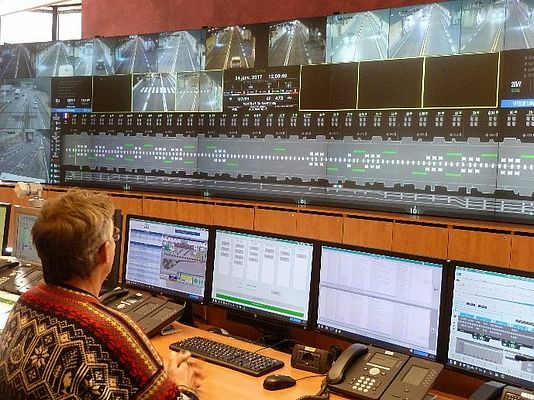 A SCADA system working in conjunction with the PLCs was provided to allow operators working in the two tunnel control rooms – one in France, the other in Italy – to monitor and control the equipment in the tunnel. By 2012, it was becoming clear that, while the PLC systems were still operating entirely satisfactorily, there was a need to update the SCADA system. The principle reason was that an update would bring the operator interface up to modern standards and provide valuable extra functionality. Another factor was that the old SCADA system was running on a version of Windows that is no longer supported by Microsoft. After a rigorous competitive tendering process, the contract to supply the new SCADA system was won by Giordano & C Spa, an Italian company with wide experience of developing and supplying electrical systems for major civil and industrial projects. However, in devising a SCADA solution for the Mont Blanc Tunnel, the Giordano engineers faced two daunting challenges. The first was that the changeover between the old and new systems had to be accomplished without disrupting the traffic flow in the tunnel. Access for installing and commissioning the new system would only be available on 25 nights, for six hours each night. The second challenge was that tunnel operator GEIE-TMB specified that the new SCADA system should meet the safety requirements for SIL2 compliance in line with IEC 61508. This is an important step towards making the Mont Blanc Tunnel the first major road tunnel in the world with SIL2 compliant electrical systems. To aid development of the SCADA system and to ensure that it would meet all of GEIE-TMB’s requirements, including those for new functionality, and also to guarantee fast problem-free installation and commissioning, the Giordano engineers knew that they would need to accurately simulate the operation of the tunnel’s 41 PLCs. Carrying out trials of the new SCADA system with the live PLCs in the tunnel was impossible because of the disruption this would cause. Ultimately, it was found that the Delta Logic Accontrol S7 simulation software was the best match for the needs of the project. It could accept PLC programs directly downloaded from the live PLCs in the tunnel, which would save a lot of time and eliminate the risk of errors, it could also meet the timing requirements, it was intuitive in operation and it was affordably priced. There was, however, one remaining issue. With the new SCADA system up and running, the simulation packages are no longer routinely needed for development purposes, but they are still being used regularly to provide training for the tunnel operators. Each of the 25 operators, who between them provide coverage 24 hours a day, every day of the year, receives between one and two hours of training every week to help maintain and improve their skill levels.